Every May, Annapolis gears up for one of its busiest weeks of the year. Lasting from Friday, May 18 to Friday, May 25, USNA Commissioning Week is chock full of fun activities. And, many folks head into town a little early and stay through Memorial Day. Therefore, with the extra visitors come the usual traffic headaches, plus Uber and Lyft surge charges. When you hire a car service for Commissioning Week, you will guarantee reliable transportation at a set price, no matter the demand in town. Here are some of the fun activities you can check out in Annapolis during Commissioning week, through to Memorial Day. Commissioning Week commemorates the First Class Midshipmen on the completion of their four years at the United States Naval Academy. In celebration of this momentous accomplishment, parents, family members, and guests attend a series of events at the Naval Academy. 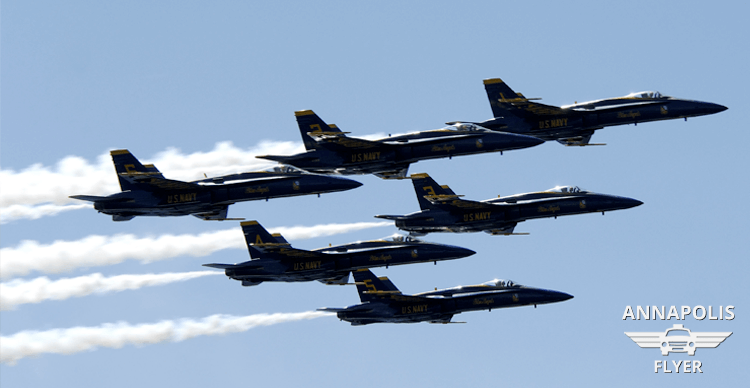 Some include the Blue Angels Flight Demonstration, Color Parade, special awards ceremonies, and musical performances. Click here for a complete list of all the activities. Tuesday, over the Severn River at 11:00 am – 1:00 pm for circle and arrival, and at 1:45 pm – 4:00 pm for a flight rehearsal. Wednesday, over the Severn River at 1:45 pm – 4:00 pm for a flight demonstration. You can discover more information here. From concerts and festivals to hometown holiday celebrations, plus parades and picnics there is no end to the Memorial Day fun in and around Annapolis. Click here for a list of events and activities for the entire family! There is no doubt that every May offers a variety of fun activities in and around Annapolis. And, with it comes significant traffic headaches. Plus, after celebrating, if you have been drinking, you do not want to take a chance getting behind the wheel. Hire a driver from Annapolis Flyer Cab. We provide the safest, most reliable car service for Commissioning Week, and all year long. In addition, we never increase our rates or add surge charges during high demand times. Our drivers live and work locally, so, you can trust that they know the area and are familiar with driving in and around town. Contact us today to book your car service!